It took a violin virtuoso leading the band at an upscale New York hotel to turn the world of dance records upside down. 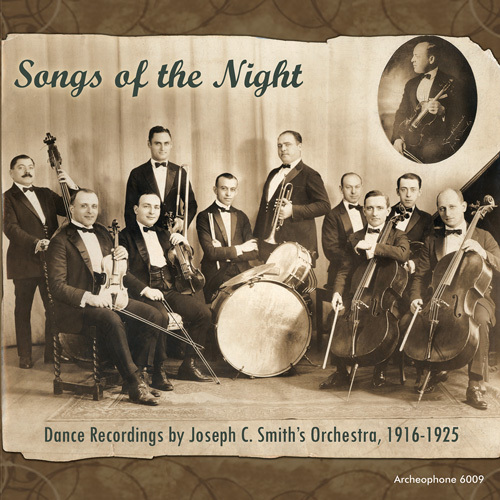 Eschewing the cold, impersonal arrangements of military bands, Joseph C. Smith brought a warmth and intimacy to the soundtrack of the 1910s dance craze–always with taste and discipline. He reinvigorated the waltz, helped standardize the fox trot, incorporated vocal refrains, and introduced many future classics. For a brief moment, the night belonged to Maestro Smith. Featuring 47 tracks recorded between 1916 and 1925, these two CDs and 32-page booklet tell the story of Smith’s career and the innovations he pioneered. Researcher Ryan Barna has uncovered new information on Smith’s life and shares valuable insights into the bandleader’s singular contributions during the rapidly-changing world of early-century dance music. He made his name at the Plaza Hotel in New York, where Victor discovered him and then employed him to be their dance master. He recorded “Songs of the Night,” “Poor Butterfly,” “Allah’s Holiday” and the first Cole Porter tune ever waxed, “I’ve a Shooting Box in Scotland.” Initial public reaction to the new dance stylings presented by Smith seemed muted, so the company allowed him to go to Columbia, where he made two sides: “Calicoco” and “When You Come Back” (both included here). Then everything changed. “Missouri Waltz” was the last thing Smith did at Victor before defecting to Columbia. Sales skyrocketed, and Victor called him back for good. Other bands made waltz records, but not like this. Smith’s arrangements were intimate and romantic; his violin was the language of love. Smith would keep the waltz, his specialty, fresh and up-to-date–whether in a sustained mood of sadness, like with “That Naughty Waltz,” or by employing a remarkable hesitation beat, like with “Three O’clock in the Morning.” Smith’s proponents insisted that while fads would come and go, the waltz would always stay around, and nobody could play a waltz like Smith’s band. Despite giving Victor some powerful hits, such as the exotic-sounding “Hindustan,” the eerie “The Vamp,” the tender “Mickey” (with vocal by Henry Burr), and the all-time best-selling “Love Nest,” Smith found himself without a label by mid-1922. A victim of his own success, Smith became passé when other bandleaders no longer followed his lead but, rather, championed new innovations and left the Maestro behind. Brunswick gave Smith a chance, billing him as”The Man Who Made Dancing to the Phonograph Possible,” and Gershwin’s “Where Is the Man of My Dreams,” as well as “Sweetheart of Sigma Chi” and “Stella” represent his time with the upstart company. Smith ended his recording career with the Canadian branch of Victor in Montreal, where Smith and His Mount Royal Orchestra were engaged. “It Ain’t Gonna Rain No Mo!” “Driftwood,” and “(I Like Pie, I Like Cake but) I Like You Best of All” show this final period to grreat advantage. Smith even provides his own vocal on “I Like You Best of All,” the last track he ever recorded. Smith spent nearly another 20 years in the business, playing hotels and restaurants to appreciative dance-and-dinner patrons, before retiring to south Florida, where he passed away in 1965 at the age of 81. There remain a number of questions about Smith’s biography, so we’ll let the music speak for itself and perhaps tell a thing or two about the essence of the man. For years, Smith’s fans have been clamoring for Archeophone to produce a set devoted to the Maestro, and here it is. With over two and a half hours of music (about a third of Smith’s complete output) and extensive notes by Ryan Barna, Songs of the Night is destined to be an early dance-band classic. The set is produced by the team of Richard Martin and Meagan Hennessey, fresh off their Grammy-nominated work on Happy, the 1920 sides by Isham Jones’ Rainbo Orchestra. As on Happy, the restorations and remastering of Songs of the Night are top notch, revealing depth and clarity in the ancient grooves that most listeners have never heard. Waxing the Gospel is one of the box sets included in this year’s edition of The New York Times Pop Music Gift Guide. Read the recommendation and grab yours today! The Vinyl District’s “Graded an a Curve” column has given Waxing the Gospel a great review and a grade of A+. The Vinyl District has given Songs of the Night an ‘A’ grade and named it Reissue Pick for September 2016. Lost Sounds was named on Jody Rosen’s list of the top ten overlooked albums of 2005. His list can be viewed at Slate.com.